In our series of talks celebrating John Ruskin’s bicentenary, Meriel O’Dowd, SPAB Scholar and architect with the Churches Conservation Trust (CCT), explained how Ruskin helped to save a church. The medieval church of St Petrock’s, Parracombe stands on a hilltop on the edge of Exmoor. 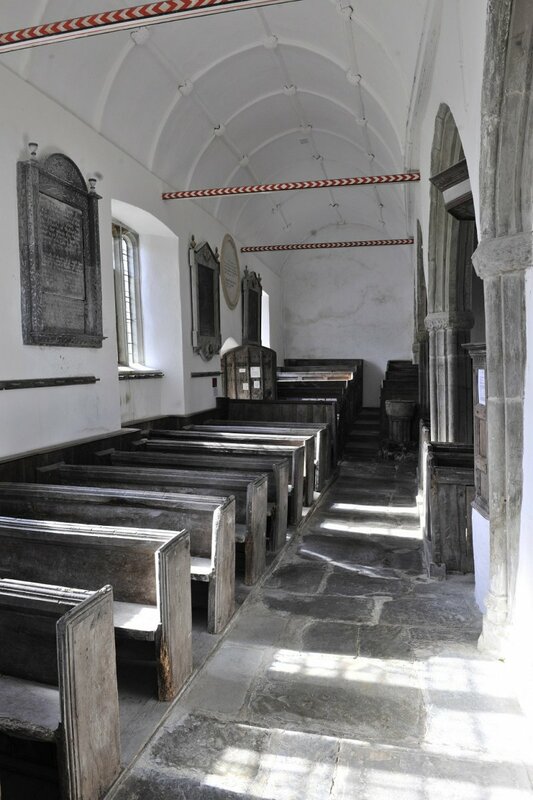 It has a lovely Georgian interior – complete with wooden hat pegs, box pews and oval plaques inscribed with quotations such as "Let all things be done decently and in order" - and a 15th-century screen. St Petrock’s was also one of the last churches where in the county where the congregation was accompanied by a band of local musicians – the change from bands to organs was chronicled in Hardy’s novel Under the Greenwood Tree. The box pew at the west end where they played still has a special hole to allow room for the bow of a bass viol (an early, smaller cello). This beautiful church is still standing today thanks in part to the efforts of passionate individuals like its rector P. N Leakey and John Ruskin, as well as organisations like the SPAB and the CCT. In 1854 Ruskin published his response to the reopening of Crystal Palace at its new site in Sydenham. He lamented how resources were spent on new architecture, when the ancient buildings were neglected or ruined by restoration. He ends with a suggestion: “An association might be formed, thoroughly organised so as to maintain active watchers and agents in every town of importance, who, in the first place, should furnish the society with a perfect account of every monument of interest in its neighbourhood… and of the changes proposed to be made upon them”. In 1877, the year the SPAB was formed with Ruskin’s support, the rector of St Petrock’s, the Revd P. N Leakey wrote to Ruskin. He explained that, though an architect had suggested he demolish the dilapidated church, he had decided to repair the medieval parish church and build a new church closer to the village more suiting the parish’s needs. “My Dear Sir, I believe that you are connected with the Anti-Church restoration society and therefore will, I am sure, assist me in very arduous work that I am trying to do”. The sale will include a collection of Indian, Chinese and other curiosities and works of art. By kind permission of the owners, there will be on view, a valuable collection of oil paintings by Gainsborough, Turner, Sir Peter Lely, Sir Joshua Reynolds, Stodard, R.A. Dante, G. Rosetti, Le Gros, Millais’ pen and ink sketch from which he painted The Carpenter’s Shop… Refreshments will be provided. The Sale will commence at noon each day. Admission, One Shilling. Bring your friends. Fascinatingly Meriel O’Dowd suggested that some of the items for sale may be in the V&A's collections today. There’s sadly no evidence that Ruskin ever visited St Petrock’s church, but something about the building must have piqued his interest. He wrote and lectured extensively about the repair of many old buildings, but St Petrock’s was a rare example when he got involved, donated and actively encouraged his friends to do the same. The SPAB offered further advice about the building’s care on several occasions during the 20th century and it has a large file in our archive. In 1971, St Petrock’s, Parracombe became one of the first churches to be vested with the Churches Conservation Trust. To find out more about the church please visit the CCT website. All photos by kind permission of the CCT.